CINCINNATI -- Imagine one of the world’s most perfect foods in the palm of your hand— round, pillowy soft and steaming hot. The steamed bun or bao zi (包子) – bao for short – is possibly China’s most delectable export. Made with soft white dough wrapped around tasty fillings, it’s a complete meal that can be enjoyed any time of the day, either leisurely or on the go. The choice of fillings run the gamut, from sweet to savory, meaty to vegetarian. Barbecue pork buns (cha shao bao 叉烧包) are a staple, filled with a savory and slightly sweet concoction of roasted fatty pork and Chinese barbecue sauce. Other staples include red beans and sweet custard buns. But really, the deliciousness in the middle is limited only by the imagination. It can include savory fillings of spicy mushrooms with dried radish, pork and pickled mustard greens, or the delicate salted egg yolk custard (liu sha bao (流沙包)—a type of “molten” filling that has a salty counterpoint to the sweetness, much like the flavor balance in salted caramel. Bao is traditionally steamed in bamboo baskets but they also can be baked, giving the buns a golden brown glow along with a toasty flavor. Go out and get some buns to celebrate National Bao Day on Aug. 22. You’ll find many places offer bao as part of dim sum (Chinese brunch) on the weekends. Here are nine spots to get you started. This 30-year-old restaurant is still steaming hot — buns and all. The best time to get bao is on the weekends during dim sum hours. That’s when you’ll find pushcarts stacked with steaming hot bites getting wheeled around and served tableside. Steamed buns include barbecue pork, salted egg yolk custard and red beans. Baked varieties include pineapple, barbecue pork and sweet custard. If you can’t make it to brunch on the weekends, you can still request bao anytime the restaurant is open but only the steamed variety. 11 a.m.-9:30 p.m. Monday-Friday; 10 a.m.-10 p.m. Saturday-Sunday. Dim sum: 10 a.m.-3 p.m. Saturday-Sunday. This brand-new eatery (less than a month old) is a bit of a drive from Cincinnati, but its proximity to Miami University makes it a great stop if you’re sending your kids off to college. The best part? It’s dim sum all day long. Bao choices include vegetable and pork, custard, barbecue pork and creamy egg yolk. 11 a.m.-9 p.m. Tuesday-Sunday; closed Monday. This quiet restaurant serves Taiwanese-style breakfast on the weekends, including authentic fare such as salty soybean milk, savory rice ball and salted tofu pudding. That’s also when you can get steamed pork buns to satisfy your bao craving. 11 a.m.-9:30 p.m. Monday-Thursday; 11 a.m.-10 p.m. Friday-Saturday; 11 a.m.-9 p.m. Sunday. Chinese breakfast: 11 a.m.-3 p.m. Saturday-Sunday. If you like high-energy environments, this place is hopping on the weekends during dim sum hours. You’ll find pushcarts lined with bao and other dim sum fare. Pacific Kitchen offers a host of options: barbecue pork, chicken, sweet custard, red beans and salted duck egg custard. Although not on the menu, you can request steamed buns outside of dim sum hours. The baked varieties, barbecue pork and pineapple, are available only for dim sum. 11 a.m.-9:30 p.m. Sunday-Thursday; 11 a.m.-10:30 p.m. Friday-Saturday. Dim sum: 11 a.m.-3 p.m. Saturday-Sunday. Tucked away in Crystal View Plaza in Sharonville, the restaurant offers steamed barbecue pork buns and mini Shanghai buns (xiao long bao小笼包) as part of its regular menu. However, 99 Restaurant does not serve dim sum. 11 a.m.-9:30 p.m. Sunday-Monday; 11 a.m.-9:30 p.m. Wednesday-Thursday; 11 a.m.-11:30 p.m. Friday-Saturday; closed Tuesday. Evendale stalwart Uncle Yip’s goes big on the weekends — dim sum pushcarts and all. You can get steamed bao during dim sum hours and at any other time the restaurant is open. Choice of steamed buns includes barbecue pork, sweet red bean, custard, mini Shanghai buns and pan-fried pork buns (sheng jian bao 生煎包). The baked options, barbecue pork and pineapple, are available only during dim sum hours. 11 a.m.-10 p.m. Monday-Thursday; 11 a.m.-11 p.m. Friday-Saturday; 11 a.m.-9:30 p.m. Sunday. Dim sum: 11 a.m.-3 p.m. Saturday-Sunday. At Great Tang you can get more choices of buns during dim sum on the weekends, including steamed barbecue pork and creamy egg yolk, along with pan-fried pork buns. Outside of dim sum hours, you can get only mini Shanghai and pan-fried pork buns. 11 a.m.-9:30 a.m. Monday; 11 a.m.-9:30 a.m. Wednesday-Thursday; 11 a.m.-10 p.m. Friday; 10:30 a.m.-10 p.m. Saturday; 10:30 a.m.-9:30 p.m. Sunday; closed Tuesday. Dim sum: 11 a.m.-3 p.m. Saturday-Sunday. If you’re looking to have bao on hand for when the hankering strikes, you’ll probably want to stock up on prepared, frozen bao. These buns are typically ready within minutes of heating, either in the microwave oven or, preferably, steamed in bamboo baskets. 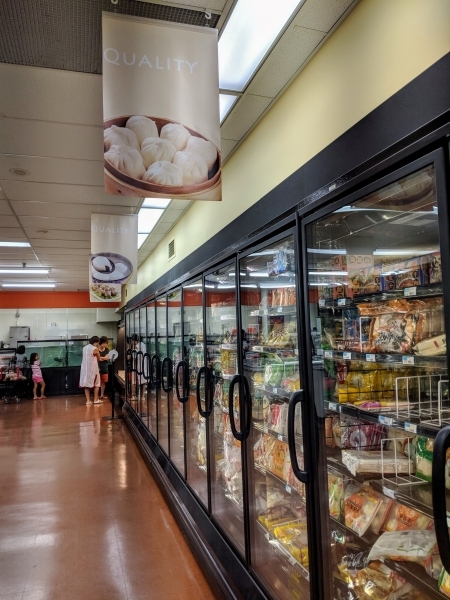 One of three market locations in Ohio — the other two are in Columbus and Cleveland — this one in Evendale carries a big assortment of frozen bao. You can even find buns with adventurous fillings such as red bean with boba (small tapioca balls). 9:30 a.m.-8 p.m. Monday-Saturday; 9:30 a.m.-7 p.m. Sunday. This longstanding Asian store at Findlay Market carries the staples: barbecue pork, sweet red bean and chicken teriyaki. Manager Nick Ho hinted Saigon Market is considering adding bao to its weekend pop-ups at Findlay, where the market currently serves favorites like fried rice and egg rolls. 9 a.m.-6 p.m. Tuesday-Friday, 8 a.m.-6 p.m. Saturday; 10 a.m.-4 p.m. Sunday; closed Monday. Grace Yek writes about food for WCPO Digital. She is a certified chef-de-cuisine with the American Culinary Federation and a former chemical engineer. Questions or comments? Connect with her on Twitter .